Bring a pot of water to a boil. Add 2 tablespoons of sea salt and the pasta and cook according to the directions on the package. Set aside 1/2 cup of the pasta cooking water while draining pasta. Meanwhile, heat the olive oil over medium heat in a pot large enough to hold the pasta. 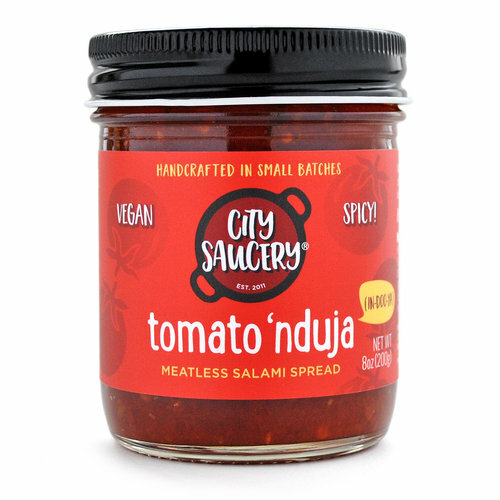 Add the Tomato ‘Nduja, stirring frequently for a couple minutes, until it infuses the oil and toasts a bit. Add the reserved pasta-cooking water and oil and bring to a boil and simmer for about 5 minutes, until the liquid is reduced by about a third. Add the drained pasta and toss. Off the heat, add the pecorino and cracked pepper and toss well. Allow the pasta to rest off the heat for 3 minutes for the sauce to be absorbed. Serve, grate a touch more cheese on top.